The OME-PCI-1800 series is a family of high performance data acquisition boards for the PCI bus. It features a continuous,330 KHz, gap-free data acquisition under DOS and Windows. The OME-PCI-1800 family has two 12-bit D/A output channels,16 digital input channels and 16 digital output channels. The OME-PCI-1800H and OME-PCI-1800L provide 16 single-ended or 8 differential inputs. 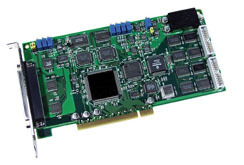 The OME-PCI-1802H and OME-PCI- 1802L provide 32 single-ended or 16 differential inputs.The suffix “H ” denotes a high gain model and the “L ” denotes a low gain model.The boards feature advanced scanning features. The scanning mechanism not only scans the different input channels at vastly different rates,but also at different gains.Even in multi-channel scan mode,the sampling rates can be maintained at 330 KS/s. 24.4 mV/°C. Biasing resistors are included for open thermocouple detection. The OME-DB-889D can be cascaded to a total of 128 channels of voltage measurements or 112 channels of thermocouple measurement. The OME-DB-16P is a 16-channel isolated digital input daughter board for any of the OME-PCI-1802H/1802L/1800H/1800L/1602/1602F/1202H/1202L/1002H/1002L PCI-Bus multi-function boards. The optically isolated inputs of the OME-DB-16P consist of a bi-directional OPTO-coupler with a resistor for current sensing. The OME-DB-16P can be used to sense DC signals from TTL levels up to 24V and also a wide range of AC signals. The OME-DB-16P can also be used to isolate the computer from large common-mode voltages, ground loops and voltage spikes that often occur in industrial environments. The OME-DB-16R 16-channel relay output board consists of 16 form C relays for efficient switching of loads by programmed control. The OME-DB-16R can be used with any of the OME-PCI-1802H/1802L/1800H/1800L/1602/1602F/1202H/1202L/1002H/1002L PCI-Bus multi-function boards. The relays are energized by applying a 5-V signal to the appropriate relay channel on the 20-pin flat cable connector. Sixteen annunciator LED’s, one for each relay, light when their associated relay is activated. To avoid overloading the PC’s power supply, this board provides a screw terminal connection for a power supply. 참고: Each OME-PCI-1800 series data acquisition board includes complete operator’s manual on CD ROM and software development kit.